While a common problem in present day, pests remain a problem in the future. Though, unlike today, several new pests have been introduced in the urban landscape. The most prominent pest in the future, or at least New New York, remains the owl, but several others co-exist. The owl, or rather one or more species of owl, was introduced in New New York to wipe out rats and pigeons. While the owls proved largely successful, they themselves replaced both species as the most prevalent pests in New New York. Owls are still capable of flight but feed on trash and have been seen exiting holes in walls, suggesting they live there. Owls, according to Walt, lay dodecahedral eggs which hatch into Owl larvae. 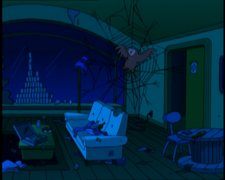 Owls can be domesticated and be taught to attack trespassers. 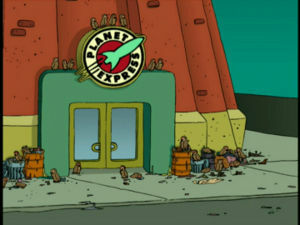 They also appear in the first level of the game, standing on top of cameras at Planet Express. Owls are usually caught in owl traps, such as "DEF-CON Owl Traps", the operation of which sounds much like a 21st century mouse or rat trap. They occasionally also get caught in spider webs. Walt, Larry and Igner posed as "Smother Bros. Pest Control" who are exterminators, deal with disposing of owls and a variety of other pests. 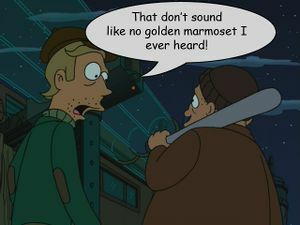 Apparently introduced to wipe out other pests, most likely some kind of insect, the Golden Marmoset is a small primate that in the 21st Century was endangered and still lived in trees. By the year 3000 they wander the streets. "There's still a roach problem." 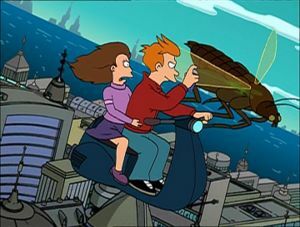 Cockroaches are still prevalent, some have been seen to be human sized and capable of flying high above the city. Despite the introduction of the owl to New New York, rats are still present, albeit with a greatly diminished population. It is fairly rare to see a rat in New New York, unless you live in the sewers, in which case your favourite burgers may have their droppings as an ingredient. On the surface, some now treat rats as birds were treated in the 20th century. 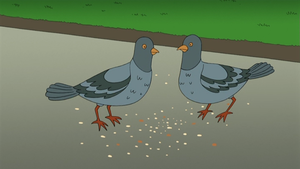 Despite the introduction of the owl to New New York, pigeons are still present, albeit with a greatly diminished population. It is possible they are now purely migratory populations, and may not even be a pest at this point. Like rats, the attempted eradication may have only taken place in certain regions, allowing the animal to return. 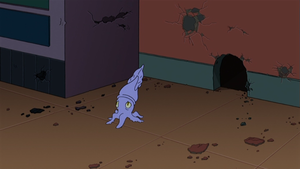 As predicted by scientists, the Squid has adapted to life on dry land. The land squid is small and harmless, not much else is known. The Gopher has adapted to presumably climb walls and are annoying pest which Fry is used to seeing. The Snail has adapted to presumably live in toilets and are annoying pest which Fry is used to seeing. Hermes: Concerning our pest problem: Somebody's been leaving food around and it's attracting owls. And I, for one, am getting tired of cleaning those owl traps. This page was last edited on 30 October 2017, at 06:54.